edenfolwell: Gallery Show: DIA DE LOS MUERTOS Opening! Had an amazing time tonight at the Opening for the Dia de Los Muertos show downtown. It was a thrilling night of art and festivities. The evening started with a procession called a Novenario, down Olvera Street. The incense burners and marigolds are traditional these processions. The procession continued past amazing altars and ended in front of the gallery. My painting "Calavera" was on the front wall. My mother, Pat Langewis, also had a painting in the show which was hanging next to mine. The curator hung them together without knowing we are related. Isn't that amazing? One of my favorite pieces in the show was a large installation by Gary Baseman. 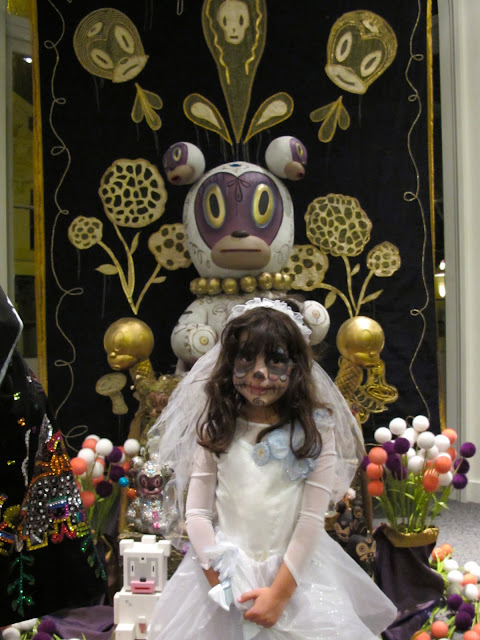 Here's my daughter standing in front of it, dressed as a bride for the procession. Brides and grooms with skull faces are traditional dress. As are angels and devils. This is Gary and I in front of his wicked installation. It was such an awesome night, I can't wait until next year!